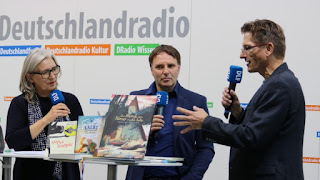 At the Bookfair in Frankfurt 2016, some weeks ago, I had the pleasure of meeting Ute Wegmann. She interviewed me several times, and one of those interviews can be read online, in German. It's the transcript of the talk Rold Erdorf (my translater) and me had for a radiostation called Deutschlandradio. It was nice to be a guest in lovely Ute Wegmanns show!